The February 2nd in-flight explosion on a Daallo Airlines A321 over Somalia led to the death of one passenger and was the first fatal airliner event of 2016. At present, the investigation into the explosion is ongoing, and the authorities in Somalia have not ruled out the possibility that the explosion was caused by a bomb. A recent crash with many similarities to the Daallo event involved a MetroJet A321 last October. This week's A321 event was the 13th time at least one airline passenger was killed on an A320 series aircraft. The Indonesian government recently release their final report into the 28 December 2014 crash of an AirAsia A320 that killed all 155 passengers and seven crew members. The authorities concluded that a combination of system malfunctions and crew actions led to the crash. Earlier this week, police near London's Heathrow airport arrested a man who allegedly pointed a laser at an aircraft. Laser encounters are a serious threat not only in the United Kingdom, but also in the United States, with over 20,000 laser encounters reported in the US between 2004 and 2014. 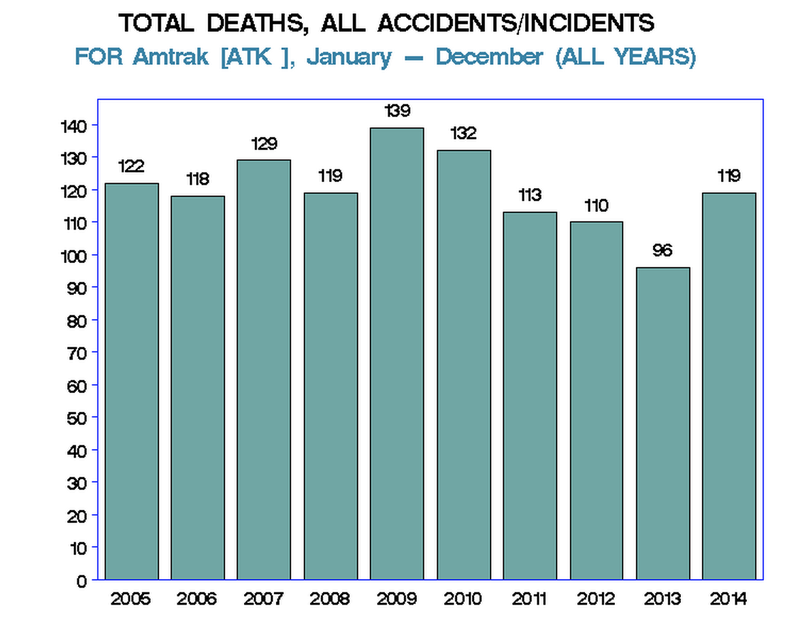 In the first six months of 2015, AirSafe.com identified eight noteworthy events, but only the two involving passenger deaths on aircraft models commonly used by airlines in the US and the EU. Those two events would be used to compute fatal event rates for particular aircraft models . 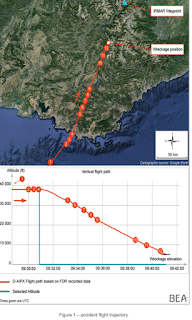 The event which has attracted by far the most media attention, as well as the most traffic at AirSafe.com, is the Germanwings crash in March that was apparently due to deliberate actions taken by the first officer. The first officer apparently locked the captain out of the cockpit, and no one was able the get through the armored cockpit door before the aircraft crashed. This was actually the second time in the past two years were one flight crew member locked out the other flight crew member and then crashed the aircraft. The Germanwings event also represented the seventh time since 1980 where a flight crew member deliberately crashed an airliner. 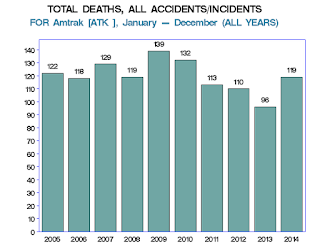 The eight total events consisted of two airliner crashes with passenger fatalities, two airliner landing accidents without fatalities, two crashes involving Hollywood celebrities, one fatal sightseeing flight, and military aircraft that crashed while carrying over 100 civilian family members of military personnel. The eight total events for the first six months of 2015 were above the average seen in the previous decade, and two the numbered events were below the average. For the 10 years from 2005-2014, there were an average of 6.4 noteworthy events, of which an average of 3.4 were numbered events. In the past decade, the fewest events in the first six months happened in 2006, with one event, which was also a numbered event. The most total events, 12 occurred in 2008, and the most numbered events, five, occurred in 2007, 2009, and 2011. 4 February 2015; TransAsia Airways ATR 72-600; B-22816; flight GE235; near Magong, Taiwan: The aircraft was on a scheduled domestic flight between Taipei and Kinmen Island, Taiwan. The airplane crashed into a river shortly after takeoff from Songshan Airport in Taipei. The aircraft hit a bridge, as well as a vehicle on that bridge, before plunging into the Keelung River. Shortly before hitting the bridge, the aircraft rolled sharply to the left. Four of the five crew members, including both pilots, and 39 of 53 passengers were killed. The two people who were in the vehicle were both injured. This was the second fatal plane crash in less than a year for TransAsia Airways. Having two or more plane crashes in less than a year has happened over 35 times since 1970. 5 March 2015; Delta Air Lines MD88; N909DL; flight DL1086; New York, NY: The aircraft was on a scheduled domestic flight between Atlanta and New York's La Guardia Airport, and had a landing excursion that led to an emergency evacuation. The aircraft landed on runway 13 and departed to the left side of the runway, coming to rest on a dike that separated the runway area from the waters of Flushing Bay. At the time of the event, it had been snowing, with freezing fog conditions and below freezing temperatures. The aircraft was also affected by both a crosswind and a tailwind during the landing. An A319 that had preceded the Delta jet had reported good braking action on runway 13. None of the 125 passengers or five crew members were seriously injured. 5 March 2015; Ryan ST3KR Recruit; N53178; Santa Monica, CA: Actor Harrison Ford was the pilot and sole occupant of a Ryan ST3KR Recruit, a two-seat, open cockpit aircraft that was used extensively as a training aircraft by the US military in WWII. According to a preliminary report from the NTSB, Ford reported a loss of engine power shortly after taking off from the Santa Monica airport, and was attempting to return to runway 3 at Santa Monica. Ford chose to land on a nearby golf course, clipping the top of a tree before landing. The aircraft was seriously damage, and Ford was hospitalized with serious injuries. This was Harrison Ford's third crash involving an airplane or a helicopter. 24 March 2015; Germanwings A320-200; D-AIPX; flight 4U9525; near Barcelonnette, France: The aircraft was on a scheduled international flight from Barcelona, Spain to Düsseldorf, Germany. About a half hour after takeoff, while at a cruising altitude of 38,000 feet, the aircraft began losing altitude, and crashed about ten minutes later. The investigative authorities suspect that the first officer deliberately crashed the aircraft. All six crew members and 144 passengers were killed. 29 March 2015; Air Canada A320-200; C-FTJP; flight AC624; near Halifax, Canada: The aircraft was on a scheduled domestic flight from Toronto to Halifax, Canada. At the time the aircraft entered the Halifax area, visibility was limited due to both darkness and snowfall, and the aircraft entered a holding pattern before attempting a landing. During final approach, the aircraft touched down about 300 meters short of the runway, apparently hitting a combination of power lines and a localizer array before sliding onto the runway. The aircraft slid down the runway about 1000 meters, coming to rest just off the left side of the runway. Damage to the aircraft included collapsed main and nose landing gear, both engines severely damaged, with the left engine sheared off, separated radome, and damage to the wings, stabilizers, and underside of the fuselage. While there was a fuel leak, there was no post crash fire. There were no severe injuries among the five crew members and 133 passengers. 22 June 2015; Short S312 Tucano T; N206PZ; near Ojai, CA: Composer James Horner, who created music for over 150 movies, including "Star Trek II: The Wrath of Khan," "48 Hrs.," and "Aliens," and who won two Oscars for his work in "Titanic," was killed in the crash of his Short Tucano in southern California. Horner was the only person on the aircraft. 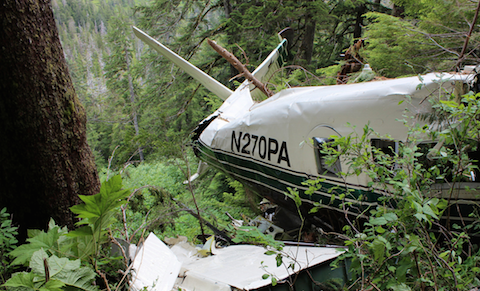 25 June 2015; Promech Air; DeHavilland DHC-3T Turbine Otter; N270PA; near Near Ketchikan, AK: The aircraft was on an unscheduled excursion flight in the area of the Misty Fjords National Monument, and crashed into an area of steep, mountainous terrain. The pilot and all eight passengers were killed. The passengers were from a cruise ship, and were on a sightseeing flight. 30 June 2015; Indonesia Air Force C130B; A-1310; Medan, Indonesia, AK: The aircraft was on a nonscheduled domestic flight from Medan to Tanjung Pinang and crashed into a residential neighborhood shortly after takeoff. The aircraft had a crew of 12 and 101 civilian passengers. The crew had reportedly requested a return to the departure airport. The passengers were military family members and the aircraft who were headed to Tanjung Pinang for Ramadan related activities. At about three minutes after the aircraft reached its cruising altitude of 38,000 feet, the captain left the cockpit. Within 30 seconds of the captain leaving the cockpit, the first officer commanded the aircraft to descend to 100 feet, which is well below ground level. Within five minutes of the commanded altitude change, the airspeed was changed at least ten times, reaching a maximum of 350 knots (402 mph, 648 kph). The descent rate reached a maximum of 5,000 feet per minute, and averaged about 3,500 feet per minute. The descent was continuous, and controlled by the autopilot. Air traffic controllers and the French military attempted to contact the aircraft several times, but received no response. Before the collision with the terrain, there were multiple aural warnings heard on the CVR. The aircraft impacted the ground about 10 minutes and 13 seconds after the aircraft started its descent. Autopilot and autothrust remained engaged until impact. On the previous flight, while the captain was out of the cockpit, the first officer twice commanded the aircraft to descend to 100 feet for short periods of time. The preliminary report did not state a definitive cause of the crash, but it did state that during the cruise phase, the first officer was alone in the cockpit and intentionally modified the autopilot instructions to order the aircraft to descend until it collided with the ground. 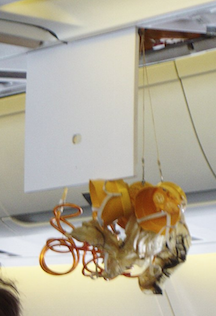 The report also stated that the first officer did not open the cockpit door during the descent, despite requests for access made via the keypad, with cabin interphone, and by knocking on the door. The preliminary report provided an outline of the first officer's training history, including the fact that he started his flight training at the Lufthansa Flight Training Pilot School in Germany on 1 September 2008, but that his training was suspended for medical reasons for over eight months, from 5 November 2008 to 26 August 2009. It was during this period, specifically from April to July 2009, that the first officer did not have a valid medical certificate due to depression and his medical treatment for his condition. From October 2010 to March 2011, he continued his flight training in the US, but was under contract as a flight attendant with Lufthansa for over two years before beginning his training to become an A320 first officer. He was appointed as an A320 copilot in June 2014. A recent article in i09.com described a reality that may surprise some passengers. In short, the passenger emergency oxygen system used in some airliners may generate small amounts of toxic chemicals in addition to oxygen. 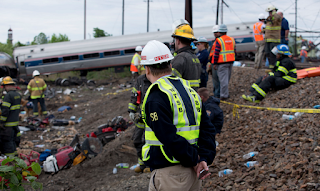 While that may sound a bit scary, the risks to passenger is rather low. Passenger emergency oxygen systems provide oxygen from either a centralized oxygen supply system that supplies the oxygen to every passenger, or it is supplied by a chemical oxygen generator that provides oxygen for a small number of masks. Depending on the generator, it may contain a combination of chemicals, which may include sodium chlorate, potassium perchlorate, barium peroxide, or iron powder, that when activated give off oxygen as a byproduct of a chemical reaction. The greatest risks from chemical oxygen generators is the heat that they may generate. However, airliners are designed to take this into account. The other basic risk is exposure to some of the byproducts from the chemical reaction. While the oxygen is filtered before reaching a passenger, is it possible that the trace amounts of chemical byproducts that remain may affect a passenger. Hypoxia is a condition where the human body is deprived of sufficient oxygen needed for normal bodily function. 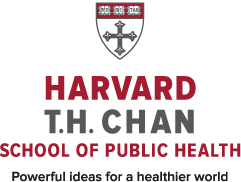 Hypoxia affects the central nervous system, and those effects may range from impaired judgment and decision making capability, to unconsciousness and death. In an aircraft that has lost cabin pressure while flying at high altitudes, the easiest way to prevent hypoxia is to breathe oxygen from the emergency oxygen system until the aircraft can descend to a lower altitude. You can find an overview of hypoxia risks on AirSafe.com. If you are interested in the effects of hypoxia on pilots and passengers, you may want to check out this hypoxia overview from the FAA. If you travel frequently, you probably have to use a taxi at least once in a while. If you have head of Uber, but have hesitated to try it out, sign up here and get a $20 discount on your first ride..
Are people with a history of depression or suicide attempts allowed to fly? - Yes they are! 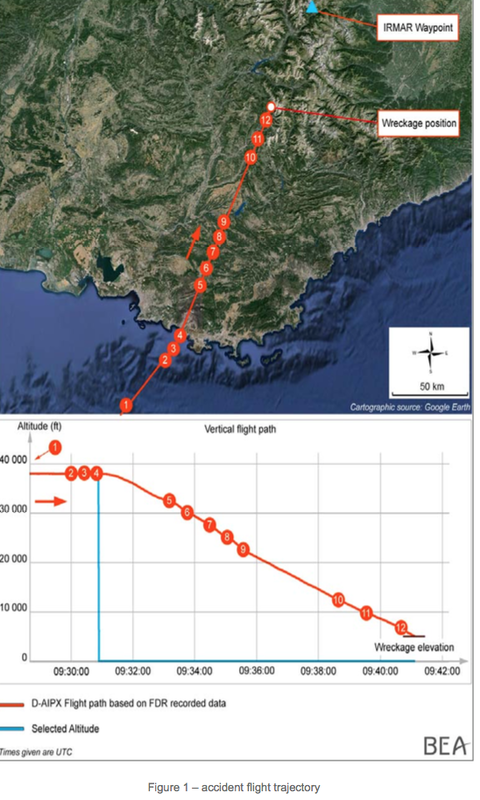 The unfolding investigation of March 2015 crash of Germanwings flight 9525 has revealed that it is very likely that the first officer locked the captain out of the cockpit, and proceeded to deliberately crash the aircraft into the French Alps. Reports by French and German authorities, as well as by Lufthansa, the parent organization of Germanwings, suggest that not only did the first officer have a history of depression, but that Lufthansa was aware of the first officer's condition. Reportedly, German investigators stated that the first officer had been recently treated for suicidal tendencies, but it was not clear if Lufthansa or Germanwings were aware of those recent treatments. One basic question that many air travelers have is how can anyone with a documented mental illness have become a pilot for a major airline. While the answer in the case of the Germanwings crash may not be revealed until the investigation is complete, it is possible to address that question for US airlines. In the US, in order to fly, a person holding an airline transport pilot (ATP) certificate, which is the type of certification that any US airline pilot must have, must possess an FAA medical certificate. The specific regulatory requirements regarding mental conditions for those holding an ATP certificate holder are spelled out in the US Code of Federal Regulations (Title 14, Part 67.107). The FAA allows physicians with specialized training to be an Aviation Medical Examiner (AME), who is responsible for evaluating a pilots medical fitness. If a pilot does not pass the examination, that pilot is not legally allowed to fly. The FAA provides AMEs with detailed guidance in a number of ways, including publications like the 2015 Guide for Aviation Medical Examiners, which had an update on 19 March 2015, just five days before the Germanwings crash. The document clearly states that a pilot has to respond to a detailed medical questionnaire, and must reveal a history of mental disorders, including depression or suicide attempts. While such a revelation would lead to further investigation, it would not automatically lead to a denial of a medical certificate. The pilot who is suspected to have deliberately crashed Germanwings flight 9525 conducted part of his airline flight training in the United States several years ago, and would have been subject to FAA regulations during that period. What do the airlines do? While it is clear that the FAA allows people with a history of depression or suicide attempts to fly, it is unclear what the policy of individual airlines may be with regards to a pilot with this kind of medical history. What and airline knows about a pilot's medical history will depend on what that pilot would voluntarily reveal, as well as what the airline may legally be allowed to know. Because this would largely depend on where that airline is located, it is possible that what an airline in one country can know about their pilot's medical history may be radically different from what an airline in another country may know.